Hello , comrades SUV lovers ! 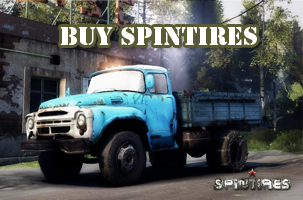 I went back to the fact that it was my first job for the 2011 SpinTires version. But , this card is a little different . We present you a pack of cards and conventional techniques. Map this large plot of land where scientific team was sent to conduct a study substance K.
It was a bad idea since the last news of them was drawing a piece of paper in the form of cards with SOS message on it. All died and all that. But , the purpose of the map to explore the map . – Find all campsites ( tent ) , and mark them on the map. – Find and mark all of the missing path on the map. How i can install it? I was unpacked in game folder but i still have old maps! Did it work with the 2014 Version ?? WORKS IT WITH THE 2014 VERSION ?